Skeletal remains found in a South African cave may yield new clues to human development and answer key questions of the evolution of the human lineage, according to a series of papers released today in Science magazine co-written by a Texas A&M University anthropology professor. Researcher Darryl de Ruiter is part of an international team that examined the discovery in a cave about 30 miles northwest of Johannesburg and originally found in 2008. This same team named the new species, Australopithecus sediba, in April 2010. The team, comprised of members from U.S., African, European and Australian universities, found multiple individuals of Australopithecus sediba that show both human-like and ape-like characteristics intermediate between Australopithecus and present-day humans. 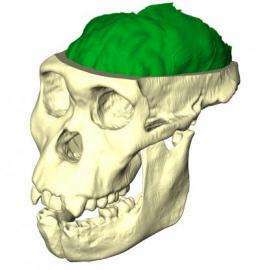 "The key message is that these remains appear to be a transitional form of Australopithecus, intermediate between earlier australopiths and later Homo, the genus to which present-day humans belong," de Ruiter explains. "We examined the remains and found several distinct individuals  possibly representing a family group. They all seemed to have died suddenly in the same event about 1.9 million years ago, but the remains are in surprisingly good shape." Australopithecus is a genus of hominins now extinct. Ape-like in structure, yet walking bipedally similar to modern humans, they are believed to have played a significant role in human evolution, and it is generally held among anthropologists that a form of Australopithecus eventually evolved into Homo. De Ruiter says key sections of the remains, such as the brain, foot, hand and pelvis, show characteristics aligning them both with australopiths and with Homo, suggesting that Australopithecus sediba represents the australopith ancestor of Homo. "The skulls are small, which is what you might expect, but their morphology shows it housed a brain shaped much like a human's," he notes. "The pelvis and foot are also similar in that regard. The foot, for example, shows an ankle that looks like human-like, but the heel is shaped more like that of an ape. But again, all of the remains appear to represent an evolutionary intermediary between Australopithecus and humans." De Ruiter says the lifestyles of the creatures were similar to apes. Although they walked upright, they also used their long arms for moving around in the trees to feed and to sleep. Like most primates, they lived together in groups, explaining why the skeletons were found together. "The skulls are particularly interesting because they show how the brain reorganized and changed in shape over time," he notes. "We suspect that something happened around two million years ago with Australopithecus. It went from an australopith way of making a living to a more human-like way of making a living. Whatever event that caused these particular individuals to die happened quickly, and their bones appeared to have calcified almost immediately. The skeletons were all found very close to each other, with some basically lying on top of another." "It's a great find," he adds, "because it provides strong confirmation for Darwin's theories about evolution."